Robert Alan Jamieson, a native of the Shetland Isles, has published two books of poetry, Shoormal and Nort Atlantik Drift, a sequence of 27 poems in his own distinctive brand of Shetlandic Scots. 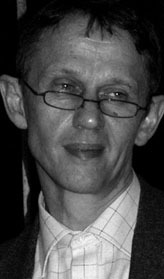 As a novelist, Jamieson has published three books. A Day at the Office (1991) was named by the Edinburgh-based List magazine as one of the 100 Best Scottish Books of all time, commenting that “each page of this book, a precursor to much modern experimental Scottish fiction, looks more like a work of art than a novel”.